This post has been spotlight featured on BlogHer. I’m so glad to know other people understand and can relate to this roller coaster called parenting. If you’re stopping by from Blogher, welcome! I’m so glad you came. Somewhere right in the middle of all that joy, I told them to sit down and smile. “Act like you’re having fun,” I commanded. But, clearly, I was not having fun. 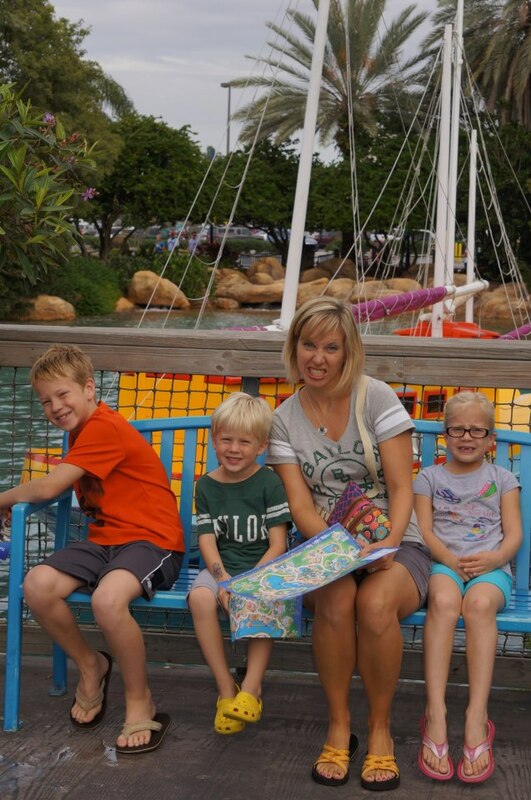 SeaWorld wasn’t turning out how I thought it would. It’s funny how we set up these scenario’s in our heads. I’m going to take them to an amusement park where they will skip merrily from one attraction to another, braids bouncing, hats turned just slightly to the side, contented smiles plastered firmly on their faces. A rainbow will form in the background. Birds will sing in harmony. But what actually happens? They fight. They pull each other’s braids and knock hats off of heads. They whine and beg for cotton candy. They complain about tired feet (never mind the fact that they can run in the backyard for hours on end, but ask them to walk 200 yards in an amusement park and suddenly their feet are broken). High winds shut down rides. A bird poops on your head. You wish you would have used that money to go get a facial. I’ve come to the realization in the last few years that special events as a family demand a special amount of patience and a realistic expectation. Expect tears and fights. Expect whining and complaining. But be on the lookout for the joy filled moments, too. They will be there, though in reality there may be more tears than laughter. 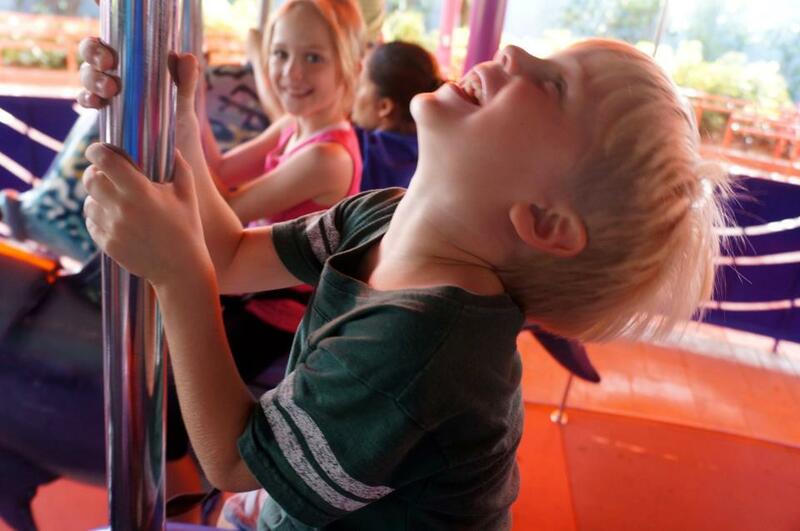 We set our kids up for failure when we plan these major trips to the beach, to the amusement park, to the movies, to the zoo or to any place that is going to over exert, overstimulate and over tempt them. Disney World may be the most magical place on earth, but it’s also the most overstimulating and any child that makes it through that park without some sort of melt down is probably just a robot. So what are the expectations? First, expect some whining and be prepared to deal with it. Stomping your foot and calling your child ungrateful is likely not the best response. He probably isn’t ungrateful so much as he’s overwhelmed. A thousand things to look at in every direction is basically system overload for kids. Be patient while they try to take it all in. Expect arguing. This one gets under my skin faster than anything else. As evidenced by the above picture, when everyone is fighting I can’t even force a smile because what I really want to do is Hulk Smash Shamoo and his permanent,perpetual grin. But if I prepare myself ahead of time and prep the kids, we can usually make it through the arguments with a tiny bit of sanity. And we might even have fun in the process. Expect crying. Don’t get angry when they cry about being tired. They’re kids. They’re going to cry. If they’re tired, find a ride where they can sit down for a bit. Find a cafe and get a drink. Go to a show. If you’re at the beach, sit under an umbrella with a juice box and take a minute to breath in deep. Give everyone a chance to recover. 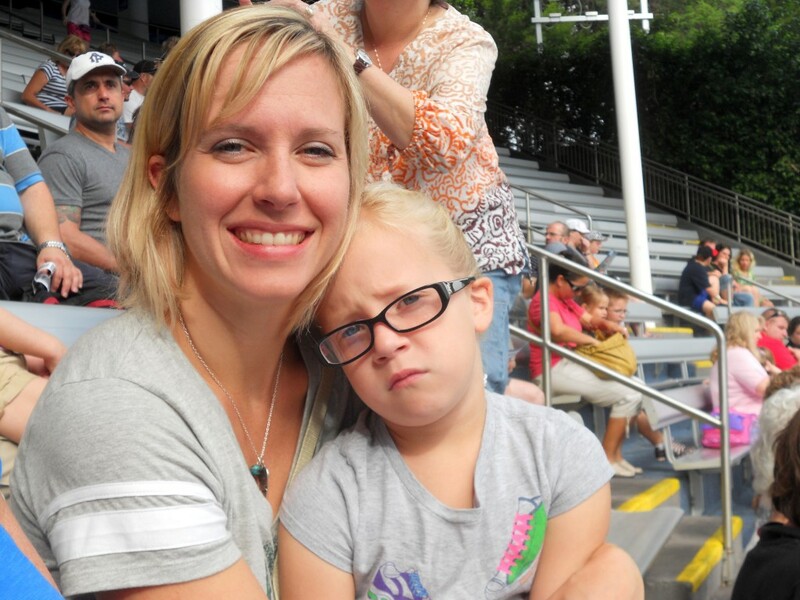 Landon cried most of the morning while we were at SeaWorld. He was tired and cranky, which made me tired and cranky. Learn from me, friends. Don’t let this make you tired and cranky! Finally, look for the joy and snap those pictures. Wait for the moments when they aren’t really aware of your watching eye and they are full on enjoying a moment. It may be brief. You may only have one or two truly joy-filled moments in a day, but capture and remember them. And when you get home, be sure to print out those pictures of everyone’s happy, smiling faces and put them in an album. 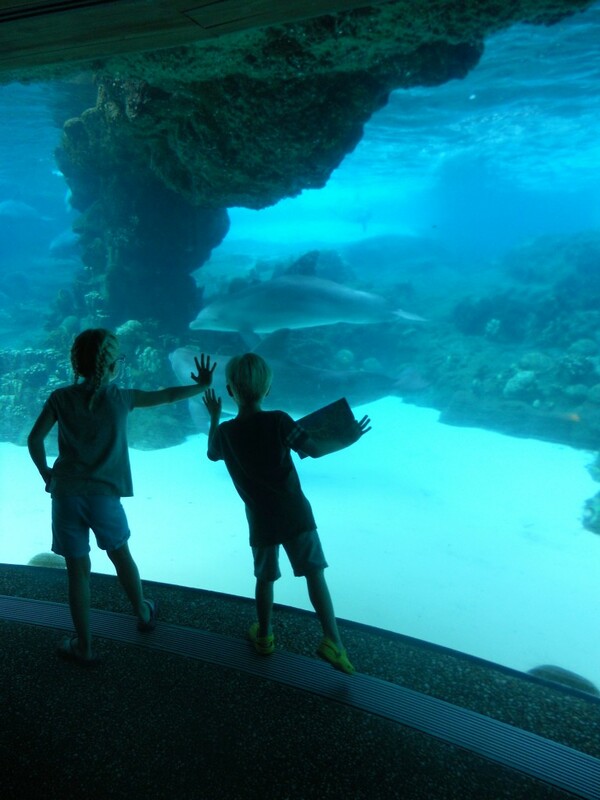 Convince your kids that the greatest thing you ever did as a family was spend the day at SeaWorld or Disney or the beach or the zoo. With any luck, all the memories of the fighting and crying and whining will fade away and you’ll be left with nothing but dreams and rainbows and harmonizing birds. Creating memories takes hard work. Just be prepared and try to enjoy the ride. What’s your favorite family memory? Disney makes it look so easy. You wish upon a falling star and anything your heart desires will come to you. But even Jiminy Cricket realized that it took more than wishing for a dream to come true. You have to listen to your heart and follow. Let your conscience be your guide. Of course, I try not to take theological guidance or direction from an animated cricket, but I do believe there is a nugget of truth buried in there. But from my point of view as a believer, I believe my Jiminy Cricket my conscience to be the Holy Spirit. It is this still small Voice, the Voice of God Himself, that I must listen to. And it is this still small Voice that I often ignore, or worse yet, simply don’t hear at all. Life is noisy. Bills, responsibilities, work, commitments – all of these contribute to the noise. And sometimes the noise gets so loud that it’s difficult to hear the Voice. But there are moments when the Voice breaks through the noise. Usually these moments are relatively quiet moments – in the still of the morning, or late at night, when the noise of life is in a brief slumber. It’s in those moments that I’m reminded that wishing upon a star is not really going to get me far. I might need to get up and start walking toward the star instead. Lately, Lee and I have felt stirrings within us. The moments come at different times for each of us, but the thoughts, dreams and ideas are the same. Some of the stirrings require small, but meaningful, planning and action on our parts. For those of you that know Lee and I well you know that planning isn’t, ahem, our strong suit. We tend to fly by the seats of our pants and, while we always have the best of intentions, this means that many big plans get dropped along the way. We’re working on this. Other stirrings, however, will require a significant amount of prayer, hard work, diligence and faith. And the faith part? It’s a doozy. I have personally never been much of a skeptic. Faith, in it’s simplest form, comes fairly easy to me. I’m not one to question or doubt. In some ways, this is a very good trait. But other times I have to remind myself that it’s necessary to think critically and not operate on blind faith. In other words, I sometimes have to make myself question the concept of faith so that I can better defend my faith. If that makes any sense at all…. All that to say, some of the stirrings within my own soul require a depth of faith that I haven’t yet grasped. A complete, life altering, Here Am I Lord type of faith. It’s the type of faith that may require me to be uncomfortable. I may have to sacrifice some of my comforts. I might even need to let go of some dreams and desires. So I’m not being totally cryptic, we’re not considering selling all our possessions and moving to far east Siberia to live in a cabin and start a slavic revival. No need to worry! We are, however, trying to open ourselves up to the What If’s. What if God called us to far east Siberia? What if God called us to serve in missions? What if God called us to go serve a meal to the homeless in downtown St. Louis? What if God called us to adopt a child? What if God called us to have another child? What if God called us to rise in the early hours of the morning and pray over our children instead of sleeping in? What if God called us to move to small town USA simply to minister to our neighbors? What if God wants us to stay right where we are and continue to serve those around us quietly and effectively? What if God wants me to drive my smokin’ hot minivan with pride all the while pouring His Truth’s into my children’s hearts as I shuttle them from here to there? The bottom line is this: We want to be ready for the What If’s, no matter what they might be. Lee and I each have hopes, dreams, desires and vision. Some of them line up and will be easy to implement – some do not match entirely and will require joint prayer. But we want to stop ignoring the whispers that have grown louder over the past few months. We want to quit talking and start doing. Which takes planning.